Djchrismac wrote: So my point is, is this high pitched tone i'm hearing possibly related to all the barium in the atmosphere? I've been hearing that sound since I was very young, back in the 1960s, so that pretty much predates chemtrails. There was one store, in particular, that used to trigger it off, a hardware place called Bennys. I later found out that they had an ultrasonic detector to give the owner an indication if someone was moving about the store (both security and "come out front"), so it may be tied in with some kind of ultrasonic signal as well. The functions of RAF Fylingdales have been subject to criticism from opposition groups, such as the Campaign for Nuclear Disarmament (CND), leading to protests being held on occasion. These stem from concerns regarding the base's association with nuclear warfare and the militarisation of space. They argue against the UK assisting the US National Missile Defense (NMD) programme with RAF Fylingdales' ability to detect attacks, claiming it to be unnecessary. The Ministry of Defence (MoD) defends the use and role of the facility however, regarding RAF Fylingdales as part of the UK's contribution to counter a military threat. The MoD states that although ballistic missile attack is a minor threat currently, this could change in the long-term future if as yet unknown enemies develop missiles as a means to overcome large distances to strike at the UK. Another RAF Station, RAF Menwith Hill, is also located in Yorkshire and has a close arrangement with the United States. It too has been the focus of protests. In June 2003, concern arose locally that RAF Fylingdales was emitting harmful emissions after a cancer cluster was discovered around a similar radar facility at Cape Cod in the United States. The issue was investigated by the local NHS organisation, the Scarborough, Whitby and Ryedale Primary Care Trust, and a report was released in December. It concluded that there was no link between RAF Fylingdales and local cancer rates nor any abnormal risk, as cancer rates in the immediate area proved to be normal. A 2003 MoD report on the impact of the NMD upgrade at RAF Fylingdales reiterated that the base was within health guidelines and would remain so. Knowing from the time-lapses that we're getting hit with frequency waves constantly as they manipulate the cloud cover, this phased array at RAF Flyingdales looks like a prime suspect for the weather modification we're seeing. The diagram of the other facilities shows the northern hemisphere, where a majority of geoengineering seems to be happening, is completely covered by all five facilities. Want to see another interesting connection? 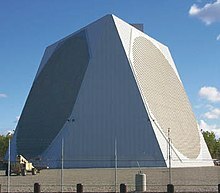 PAVE PAWS is a United States Air Force Space Command radar system operated by three 21st Space Wing squadrons for missile warning and space surveillance. 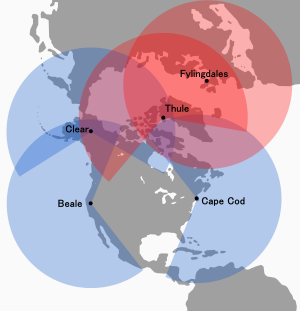 Coverage of PAVE PAWS is shown in blue (see diagram above). This complements the coverage provided by the BMEWS system in red. Both report back to Cheyenne Mountain Air Base in Colorado. Maybe I should start saying "PAVE PAWS Cloud Sunset Time-lapse" now! The amount of synchronicity in my life, has reached comical status. Today, I walked the graduation floor, in a clearly freemason-inspired gown . A dark sky, shrouded most , of what looked like my neighborhood. There were some incorrect features. the building I was inside, being one of them. There was a gathering of "ignorant" folks from my high school class. There we stood, all talking noisily.. I look out a window , I can say was north-facing. A big red, 4 propeller driven plane, almost like a fire bomber , is flying low, east to west. I knew the plane was going to crash, the within moments of setting eyes on it. They believed this plane was not inferior, and that I was an idiot . "Shut up, that's ridiculous", ect. The plane crashed, a mile or so away, followed by a tremendous explosion. There was a sudden scene change. It was no longer nighttime, but a time of great panic ; a tornado-warned thunderstorm was approaching . Clinging to me, is a young woman I have been thinking about . We trek down into the basement, and there is no more recognizing the building. It's almost like a new, above- ground structure. There is a heavy emotion at this time, near the conclusion of the dream. "It felt like the ocean" , We said. Now I'm sure there are many , many details I have forgotten. None the less, this dream comes in the midst of a dry spell of nearly no dream recall. We are seeing an uptick of some sort . daniel wrote: Not being an audio guy, my estimate was at 6.5-7khz. It is very interesting that what you describe is pretty much identical to what I've experienced. My buddy can't recall sending that SMS and didnt understand the context either. I know I created the event because it had to happen. We were trying to save lives here. People were starting to starve in the makeshift camps, this was before UN deployment. I have been having "events" like this more & more for years now and will post more about this in my Antiquatis forum, I just need to organise my thoughts. Lozion wrote: I have been having "events" like this more & more for years now and will post more about this in my Antiquatis forum, I just need to organise my thoughts. Excellent. I also experienced quite a few "interesting" things since I've found out about CH and AQ, I'll also share them when the time is right - e.g. in the last few months only, my (16-year old) car brakes failed twice while driving and the same (left back) tyre went flat twice. That's why I made a post about the movie The Medusa Touch, I did it for a reason. I'm already convinced that the tones are reminders, and a pineal gland effect. They happen to me frequently. One of the most intense occurrences of this (in the " aware"window of my life) happened at a highly paranormal location, east of Evansville. We headed out on a scientific expedition, one night. It was a cathedral-like tunnel of oddly deformd trees along "weary road". On foot, we discussed the history here, and walked the entire grove of trees. it lasted more than five seconds, and then tailed off.. Hundreds of townspeople were hung in these trees, a few centuries ago. The wight of the bodies, caused the then-young trees to grow weirdly. I don't know for sure if it was the Catholic Church , but there is evidence that many witches were targeted around here . The moon had a large ring around it that night. It was an emotional experience. Upon retuning home, the moon had become orange and sported a huge chem trail looking UFO protruding off of it. daniel wrote: If I understand you correctly, that's a "jing thing." Good food and exercise builds jing, which is easily converted into qi bioenergy. Thinking and feeling (in the Jungian sense) convert qi to shen (kundalini). LoneBear's post on Artificial Intelligence on Antiquatis discussing the neocortex is an interesting connection; when you concentrate on a problem, you stimulate the neocortex and it produces high levels of energy, both electric, magnetic and bio--and it is located right at the top of the skull, where the crown chakra is. daniel wrote: Shen manifests as agápē, which is normally associated with a "spiritual calling" or "life devoted to God" type of stuff. If you get rid of the religious connotations, agápē is essentially the physical expression of shen bioenergy under intelligent direction, which leads to the growth and expansion of consciousness--for yourself and everything around you. When that happens, you become connected to the Universe (rapport) and the Universe "helps out" through synchronicity and serendipity. Once you are in rapport with life, then you don't require partners (as you become internally balanced) and things just happen to keep moving along. You no longer worry about "financial security" or stuff like that, because it becomes unimportant, since the Universe is a far better provider than governments acting as surrogate parents. And I speak from experience, here. daniel wrote: if you were to remove all your chains and constraints of physical commitment, money, work, shelter, etc., and could do the ONE THING that you really love doing, what would it be? daniel wrote: That's one of the reasons for a physical place to Kheb, so that there are resources and others there to help people find the path that is right for them. This is nothing new... if you look at old, alchemical paintings, you'll see people walking around with blindfolds on (the caecus--the blind, or in Harry Potter words, muggles). So you need to get out of the dark. Things are moving slowly--forward, but slowly. There is a lot of negative bioenergy on this world that tends to retard ideas like this, even when most consider it insignificant, so it takes some perseverance. daniel wrote: Things are moving slowly--forward, but slowly. There is a lot of negative bioenergy on this world that tends to retard ideas like this, even when most consider it insignificant, so it takes some perseverance. Ok, keep us in the loop. I'm looking at relocating before years end.